390 pages | 4 B/W Illus. 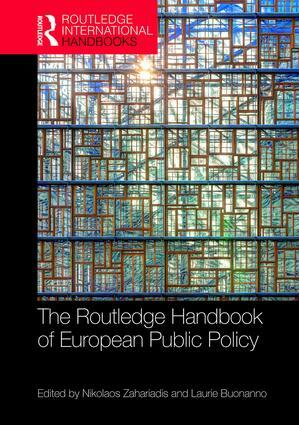 The Routledge Handbook of European Public Policy provides an in-depth and systematic understanding of EU policies. It covers theoretical approaches on the policy process and the various stages of public policy formulation and decision making, and discusses key questions of contemporary European governance. The handbook introduces major concepts, trends, and methodologies in a variety of comparative settings thereby providing the first systematic effort to include theoretical and substantive analyses of European public policies in a single volume. Themes ranging from crisis and resistance to controversies in education. This handbook will be an essential reference for students and scholars of the European Union, public policy, social policy, and more broadly for European and comparative politics. ‘This handbook contains everything we need to know about European public policy. From conceptual approach to concrete policies as well as topical crises. I consider this a must read for my own European Studies students.’ - Esther Versluis, Maastricht University, The Netherlands. ‘This handbook will be essential reading for those seeking a comprehensive understanding of European public policy, giving readers a strong theoretical basis for interpreting the detailed policy studies. The book combines academic rigor with a deep understanding of the intricacies of EU policymaking. Researchers and students alike can benefit from this volume, given its depth and accessible style.’ - Michele Chang, College of Europe, Belgium. ‘The editors set themselves the ambitious task of furnishing readers with the tools needed to assess the trajectory of European policy making in an anxious environment. By authoritatively illuminating the structures, substance and challenges of an intricate and dynamic European policy landscape, they’ve succeeded admirably.’ - Mitchell P. Smith, The University of Oklahoma, USA. Nikolaos Zahariadis is Mertie Buckman Chair and Professor of International Studies at Rhodes College, USA. He previously served as Director of International Studies at the University of Alabama at Birmingham and has received numerous research fellowships and teaching awards. Laurie Buonanno is Professor and Director of the Master of Public Administration and Nonprofit Management program at the State University of New York, Buffalo State, USA. Her research focuses on comparative public policy, comparative public administration, the European Union, and transatlantic relations.